The Bull Shark is one of the deadliest and aggressive sharks in the ocean. It is responsible for the majority of fatal shark attacks on humans close to shore. The Bull Shark (Carcharhinus leucas) is one of the deadliest shark in existence. In fact the Bull shark is among the top three sharks implicated in unprovoked fatal attacks around the globe. The species is known by different names, such as cub, shovel nose, slip way gray, granges, nicaragua, and St. Squarenose. Putting its aggressiveness aside this is a magnificent species, It is a large shark with a stout body. The top of the shark is gray and the bottom is white. 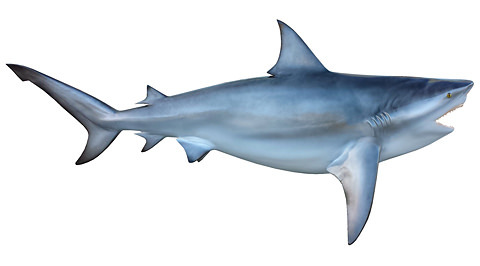 However do not let the size fool you, even though the size of this shark may seem bulky, it is a very fast swimmer. On average the female Bull shark weighs about 500 pounds and is 5 feet long where the male is smaller weighing around 200 pounds and measuring around 7 feet. On occasion they can grow to about to 11.5 feet in length, although they rarely grow past 9 feet. The bull shark can give birth to 1 to 13 pups per litter. The pups are around 28 inches (2 feet, 4 inches) long at birth. It is a shark that can live in both fresh and saltwater, and travel far up rivers and, as mentioned, it is responsible for the majority of fatal shark attacks on humans close to the shore. This particular shark can be found primarily in shallow coastal waters and is also common in lagoons, bays, and river mouths. Bull sharks can also be found in brackish water and have been caught in the Mississippi River as far upstream as Illinois! It reaches maturity at about 6 years and normally lives beyond 14 years. In the Atlantic, Bull sharks are part of the large coastal shark management group, which is overfished; commercial and recreational fishing regulations are in place for this species. In the Pacific, Bull sharks are not landed in commercial and recreational fisheries and no management measures are in place. Finning is prohibited.